My wife and I have just spent the last few months watching every episode of "Doc Martin" a British TV series about a Doctor (not that other Doctor) who relocates from a job as a top surgeon in London to general practitioner in Portwenn, a tiny fictional village in Cornwall. It's mostly a comedy series but it has some drama and romance elements as well. The reason I'm reviewing it here however is because Doc Martin's character is, I believe, intended to "have Aspergers Syndrome" and for neurotypical adults this gives you a good glimpse into both sides of an AS/NT relationship. Nobody does situation comedy for Television better than the British and Doc Martin doesn't disappoint in this area. Although it is very funny, it's actually in the development of Doc Martin's relationship that the show really excels. Each story is relatively self-contained but it is strongly recommended that you watch the series in the correct order to get a good sense of this development. The words "Aspergers Syndrome" so far have only made a single appearance in the show when a psychologist tells Doc Martin that he has it - shortly before being unceremoniously bundled out the door but there's no doubt that the writers intended it to be a talking point. Remember that there's no litmus paper test for Aspergers Syndrome and someone may display many of the symptoms without actually having it. In Doc Martin's case, who but the scriptwriter really knows? Doc Martin certainly feels emotions and empathy but usually doesn't show them in the way you'd expect. Some close people however are able to read them some of the time. It's clear that he has an unusual gait (walk). He has significant difficulty in conversations and minimal ability to small-talk. He does prove that he can "act normal" though but it's obviously an act. He has two obsessions, medicine and clocks - I'm aware that you'd expect a good doctor to be interested in medicine but Doc Martin takes things a little too far at times (Series 5). He's obviously quite confused at times as to why his remarks hurt other people. He's clearly completely unaware of some of the signals that others are giving off (pharmacist). Failure to share interests, enjoyment or achievements with others. Preoccupation with one or more narrow interests which are abnormal in intensity or focus. C. The disturbance causes clinically significant problems in social, occupational or other areas of function. D. There is no clinically significant delay with language milestones. But I'm not here to say whether or not he's an aspie. It's a great show and my wife and I have gotten a lot of enjoyment out of watching him and his situations. Our discussions during and after the show have been quite good too because sometimes it's easy to see what a particular character should have done when a communications problem occurs. It's very educational for people in mixed AS/NT relationships. 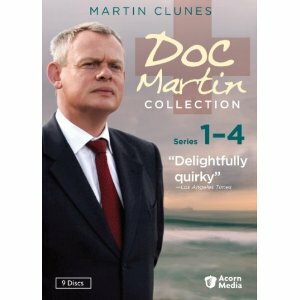 Doc Martin Series 1-4 is currently available at Amazon (and it's on special). Series 5 is currently airing around the world and there's currently a campaign going around to get Series 6 filmed. Doc Martin was recommended by my parents and I watched it purely on their advice. I was not given any review materials but sought the show out on my own. I have just finished watching all five series and am now starting watching series 1-4 again! I cannot get enough of Doc Martin. It is wonderful and I love the AS/NT relationship development but I think the second most appealing this to me is the community of Port-Wenns acceptance and developed love for the Doc despite his social constraints and mannurisms. LOVE LOVE LOVE it. Thanks for this tip. I've just checked Netflix, and it is also available for instant download (streaming). I look forward to watching, as I'm still learning to better understand my 16-year-old son with AS. Temperance Brennan of Bones also plays an Aspie without it being mentioned in the show. Ps, I'm nt and would have no idea what someone meant by 'move the washing around' as per the previous posts unusual comment!! I would have moved the washing in the machine in case it was unbalanced maybe? Communication problems abound all round, regardless of nt, as it seems. i absolutely love watching doc martin and for a while wondered why. and your post has cleared things up for me! must have missed the episode where it was suggested he had AS but i can clearly see it, i think the programe intrests me a lot as i'm a nurse with AS so can relate to alot from the medic/patient relationship. My wife bought the box set for Christmas and we have just finished watching it. We had a Doc Martin marathon! We absolutely love it. Though his provisional diagnosis of AS was a compelling development, I felt the credibility of the therapist giving it was somewhat undermined by his own circumstances - ie, his badger-burning wife, anti-social son, and a kind of invasive loser's social dependence ('Have you got a corkscrew? ', and 'Do you mind if we have dinner here?'). It didn't need to be treated seriously. What a wonderful cast of characters! Hi - can we include a link to this article on the website? Sure you can link to this post however you want to. In my family, there are 2 Aspies, of different generational levels, both exceedingly bright. But, especially the first one (my brother) is a great example of how difficult it is to succeed when you can't read people properly. So prior to the psych suggesting it on the show, it had already occurred to me that this was Doc Martin's problem. I'm torn about his "diagnosis" because, unlike my brother, Doc Martin seems to have the capacity to learn & improve. And I really didn't get the feeling that the writers or Clunes were aiming for an Aspie character. I was recommended this series on the strength of my love for British television and being an old Northern Exposure junkie. The characters in Doc Martin make the Northern Exposure characters look entirely well-adjusted and normal. Leave it to the Brits to hone quirky characters to a fine point. I didn't consider AS until the crazy psychiatrist suggested it and then I just bolted up. Of course! But then also if you saw the episode with his mother you might put it down to environment. @philogaia, i agree Doc Martin's odd behavior and social skills (or lack thereof) may be a product of nurturing and not AS. I think the writers intentionally leave it ambiguous so it makes Doc Martin's character more interesting and appealing and the audience continually guessing is he or is he not. He certainly peeks my curiosity because he sees the world in black and white and tends to be straightforward, like myself, yet he is so extraordinarily brilliant as a doctor. I'm an NT who was involved with an AS for some time and also suspect that my father was AS. I've watched the whole Doc Martin series, as well as the 2000 movie (also called Doc Martin on Netflix). While the TV show and its main character are based on the movie, they are not the same. It seems to me that while the TV Doc Martin is an angry AS, the movie Doc Martin is an angry NT. I think watching and comparing these two versions may be an invaluable tool for anyone trying to understand the difference between the two, in terms of observing behavior. As an Aspie-without-portfolio (no canonical diagnosis), I can recognize Asperger's in both the characters of Martin and the young lad Peter. In my opinion the actor Martin Clunes is not an Aspie, but the writer(s) and the actor both are quite familiar with at least one Aspie upon whom the character is modeled. Clunes expresses emotions with his face in a manner suitable for TV (somewhat understated for the stage), but with a facility that Aspies lack. Kurtis O'Brien (who plays Peter Cronk) may be an authentic Aspie himself. Aspies are rare in the acting profession because the camera/stage demands a facility with emotional expression that is extremely difficult for Aspies. The most successful Aspie I can think of in front of the camera is Leonard Nimoy. Not all people with Aspergers syndrome have the same degree of difficulty managing facial expressions. There are actually quite a few people with Aspergers syndrome in the acting profession because people with Aspergers find themselves mimicking other people's voices and mannerisms constantly in real life as a way of fitting in. It's a very small step from there to acting. "Rain Man": Raymond, an autistic savant of whose existence Charlie was unaware. I am a recently diagnosed Aspie & my psychologist considers Doc Martin classic Aspie. She also has a colleague married to an Aspie surgeon who she says is very much like Doc Martin. I am an Aspie with several Aspie friends. 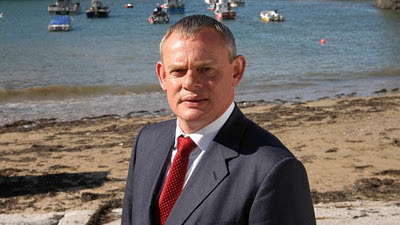 I've started watching the TV show Doc Martin: He struck me immediately as a very clear Aspie. No fictional character is a perfect representation of Aspergers, but I'd say he comes closer than many of them. My husband of 33 years is a diagnosed Aspie. I just started watching the series from the beginning, and find it delightful! After episode one, I suspected Doc Martin was an Aspie, after episode two, I was pretty sure, and after 3 episodes I'd bet my last dollar on it. Delightful show, wonderful characters, terrific acting, great scenery! And, adult Aspergers needs to be known and understood by society, so I say hooray. As Martin Clunes is an actor doing very well to behave like an aspie it is surprising how well he does it. I thought all along that he was meant to be on the spectrum - that is why I liked watching it. I could identify with the behaviour of my husband - who undiagnosed has always behaved oddly. It interested me that Doc Martin tries to have a relationship but can't understand why it does not work - just like I can't understand why mine never do either. I am a licensed psychologist and I have treated/evaluated several AS clients. Before watching the first episode (actually this year (2013) on PBS), I said to my wife "Doc Martin is a classic AS". I am glad to find this webpage that confirms my suspicions. Lots of good info here. 1. It is pointless to question whether or not Doc Martin has Aspergers syndrome. He is a character in a fiction. 2. It is not relevant to question whether Martin Clunes has Aspergers. He is an actor, and should not be confused with the character. 3. It is valid to question whether the character Doc Martin is designed by the writers to be an Asperger. It is becoming more and more frequest for characters to protray some elements of Aspergers. 4. In diagnosing Aspergers, it is not relevant to compare one case (as portrayed in this series) with any other diagnosed Asperger, whether real or fictional. The clinical process of diagnosis looks for a threshold of a number of traits out of many traits. To illustrate, one Asperger may have 7 traits, another may have 7 traits, and none of the 7 traits are common to both. Terry.... and of course, since the DSM V Asperger's Syndrome technically no longer exists. For me, the interest was whether or not Martin Clunes (or his writers) were deliberately crafting a fictional individual who would overreach the trait thresholds for Asperger's syndrome or whether it was simply based on one or more individuals they had observed and found to be "funny". Somewhere on web while looking up possible aspects of the Doc's character, I saw it suggested AS symptoms _may_ include unecessarily repetetive actions. This makes me think of the OCD assistant watch-watching teacher at Louisa's school, or of detective Monk from a different series. I don't see much or any of Doc E. exhibiting that aspect but other viewers maybe can advise they do see it. Also I hope sometime Clunes Catz Minghella et al do a, say ten year, follow-up with e.g. a growing James Henry handling his parents gradual self-insights (Louisa has her moments too, not just Martin), and we could see if Al and Bert are still at large, if Tishel has, ahem, dispensed fully with her infatuation confusion, and of course more of the ever-delightful Portwennians. As Danny would say, bless them! I am in a AS/NT relationship and boy oh boy does this show remind me of the ROCKY START I had in my relationship. My AS partner relates to the character and also happens to be in the medical field. The episode where he first kisses Louisa, then proceeds to comment on her dental hygiene and ruin the moment was my EXACT EXPERIENCE as well. I couldn't believe it. They might not be trying to but they really nail Asperger Syndrome. Love that show! I just love the show! It's just so funny but at the same time serious enough to be credible. All the acting is superb, especially Clunes's portrayal of the titular character. I hope they keep making it. Thanks for letting me comment. I asked google "Doc Martin - what is his diagnosis?". Because I think the character Doc Martin does have Aspergers and his mannerisms and character are very similar to my partner's. He has not been diagnosed. But he is unusual in how he shows love, affection, understanding of others and - at times - behaves how he should do out of duty without showing emotion. He is highly intelligent and very successful in his chosen vocation - holistic. I just want to understand him more without directly suggesting to him that he could be Aspergers. Because maybe he isn't.! But I do think he certainly might be. Although on the face of it Doc Martin certainly appears to have some of the traits of Aspergers, series 6 and 7 show us that in fact he has an attachment disorder. The writers acknowledge Martin's autistic traits in one episode but you can see in an early episode featuring his mother that she is completely cold towards him and that they have no relationship. In series 6 his blood phobia returns etc prompted, it seems by the arrival of baby James. His psychiatrist aunt tells him that he has been psychologically damaged by his parents and instructs him to seek therapy. In series 7 this happens and he is diagnosed with attachment disorder. I do think however, that there are indications that he is not autistic before this. He is grumpy and deliberately rude a lot of he time. He is irritable and supressing anger, afraid of his emotions, blanking them out on purpose. Also attachment disorder affects social and emotional development; and it can often be difficult to tell the difference between the two conditions. My brother worked at an autism school, and a few of the students were rediagnosed with attachment disorder and removed from the school. It's hard though, to put into words what it is that conveys attachment rather than autistic problems with Doc Martin, but Martin Clunes does a fantastic job! I had, & asked the same question to Google, and here it is. I think Doc Martin tv could be a good way to start a discussion about the dynamics, with a family member who is religiously drawn to the show. I suffer from dsythymic disorder due to childhood trauma and childhood emotional neglect. I see a lot of my personality in Doc Martin and have often wondered if I am borderline AS. Actually, there's an episode in series 2 where his aunt looks at him and implies that he has Asgergers; that episode mentions it twice. I'm now on series 4 and there's been no mention of it again but he was just given a referral to a psychiatrist from his ex girlfriend. I didn't see the first 2 series, but now, into series 6, I blurted out "He's an aspie!" I didn't discover (figure out) my own aspieness until I was in my 60s (I'm 79 now). The enlightenment changed my life. I don't understand this "autism spectrum" crap, either. We're just the way we are. I only wish we had real doctors as brilliant as Martin, quick to diagnose and treat rare diseases, and running around making house calls! That's the only fiction in the show!